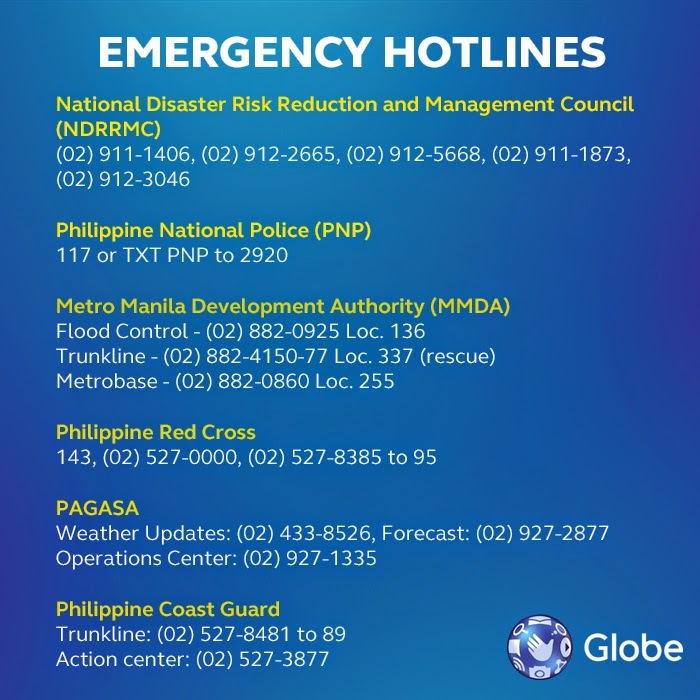 In line with the recent Typhoon Mario situation in the country, Globe outs emergency hotline numbers for the public to contact. This includes National Risk Reduction and Management Council, Philippine National Police, Metro Manila Development Authority, Philippine Red Cross, PAGASA and Philippine Coast Guard. Yesterday, Mario, with international name of Fung-wong has categorized six provinces under Signal No. 2. These include Cagayan and Babuyan Islands, Isabela, Kalinga, Apayao, Abra and Ilocos Norte. These areas will experience stormy weather and rough seas. Currently, the typhoon brings heavy rains and floods in Metro Manila and neighboring areas.